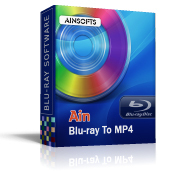 AinSoft Blu-ray to MP4 Converter can help you convert Blu-ray to MP4 format, such as convert Blu-ray to MPEG-4, Blu-ray to MP4(H.264) video. You can also preview your movies with high definition before conversion. To make your own movie or music, you can select the window mode and edit and crop Blu-ray movie by setting the begin and end time to get your favorite part before conversion. With its professional edit function, users could choose applicable video definition, video size and audio channel that meet your needs before Blu-ray to MP4 conversion. Weclome free download and have a try. Rip Blu-ray directly without assistance of third-party control after installing if your Blu-ray MKB version were 1-10. To meet your requirement for subtitles choosing, AinSoft Blu-ray to MP4 Converter provides you options of choosing subtitles easilythat your original blu-ray movies had. With this AinSoft Blu-ray to MP4 Converter, you can seclect any audio tracks for meeting your needs so long as your original movies had. 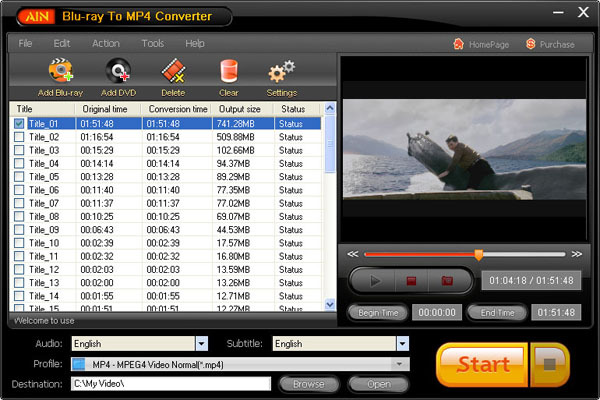 Movie crop function of AinSoft Blu-ray to MP4 Converter will help you only rip your favorite part. You can achieve this by setting the duration. The other personalized settings, such as automatically shut your PC and set the video and audio quality to get you a better output effect, will make you like this program more. Blu-ray DVD Ripper to ronvert Blu-ray and DVD movies to more popular video and audio formats. Convert Blu-ray to iPod video for enjoying Blu-ray movies on iPod nano, touch and iPhone freely.